The American Psychological Association (APA) recommends a reference and formatting style for many academic disciplines, in the social sciences and beyond. 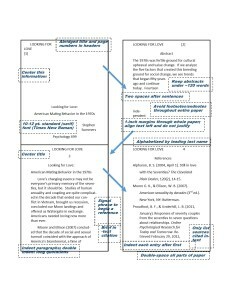 If you’ve ever found yourself stuck on how to use this style for writing reports, articles, essays, or other projects, here’s a chart and example explaining the fundamental principles and guidelines. Also, check out the Purdue Online Writing Lab (OWL) site for more information in much greater detail. Here’s the chart, good luck! Feel free to leave questions for more tips. Hearthstone is a Blizzard-made, virtual card game that’s free to play. I enjoy/begrudgingly grind through it a bit nearly every day, while I have managed not to spend any real money in-game so far. Something about the fact that you’re paying for what could be the worst cards in the game keeps me from going crazy with it. But it is a fun game. However, sometimes it’s not. At those times, I want to give my opponents a taste of the angst I feel at how they’ve beaten me with purchased cards (no doubt bought by a rich, doting—but also emotionally distant—father) whereas my poor, orphan soul must make do with the free scraps I can grasp. Unfortunately for me, Blizzard foresaw my salty demeanor and put checks in place to keep bad sports like me from ruining the game for everyone else. Instead of being about to simply chat with the opponent you’re matched up with, there is no direct text exchanged. Instead, you have one of six terms you may offer at any point in the match. Your characters may say “Hello,” “thanks,” “well played,” “oops,” “sorry,” and they may also “threaten” the opponent if you are so inclined. Now. It would sound like making threats would be the solution for someone who takes the game as seriously as I do. But the reality is that these threats are quite weak and childish. Having your cartoon hero threaten the other guy’s cartoon hero with “Justice demands retribution!” or something equally-vague only makes you look about six years old. So I’ve tried several different work arounds. One way to display irritation is just to keep spamming “Well played’ or “Thanks” or “Sorry” or something, but these feel weak and ineffectual. And there’s nothing creative in them. Though, arguably, they are stronger terms than the built in “Threats”—phrases that seem close to what young children probably think grownups say to each other when they’re angry, formal insults that might once have necessitated a duel. I found a solution. It turned out you could chat with your opponents—if you turned them into your friends. After each match, you’re told who you last played, and you’re given the option of adding them to your friends list (this is on the mobile version—you may have more options on the desktop game). Some of these opponents, perhaps seeking congratulations on their excellent play and financial prospects, would agree to our friendship. This allowed me a direct chat line to insult their playstyle, hobbies, and breeding. Then I could defriend them immediately after. Remember, dear reader, I chose this avenue because it was certainly less childish than the in-game insults. Time passed as it tends to, and I realized many folks who beat me in the game simply didn’t want to be friends thereafter, for whatever reason. To put them into a more receptive state, I would thus begin to give them a hearty “Hello” at the start of a match, and a thin-lipped “Well played” at its end. This was to prime the pump, and perhaps make them a bit more likely to befriend me, unaware that I was only interested in excoriating them. This helped, at first, but over time something else changed. Instead of being offered the chance to befriend the last opponent after each match, I ran into some trouble. Sometimes the option to add a friend would no longer show up. Sometimes it was just the first match of the day. All right, first guy gets in scot-free. Not a big deal, I’ll get the next one. But then it would be the next one, too. I could add friends after winning games, but I had no interest in that. Blizzard must have figured out my game. So I took stock of my situation. Strangely, I had forty-odd extra people added to my friends list, after months of this. Some people were amenable to my banter, and others I’d actually forgotten to insult at all, and later I would congratulate them (truthfully) when they found legendary cards or rose in the ranks. As it turned out, to most of them, this was just a game, not something to get upset about. While I respectfully disagree, I can at least appreciate that they certainly believe that. And in the meantime, it’s not so bad to have a horde of fellow players around to keep things cozy. Just so long as they all know how cheap their empty wins are, in comparison to my own skill, scrappiness, and smarts. Ordering from a fast food place is like having to choose your best friend. Can’t I just have one of everything? Sometimes this is not feasible, as my doctor tells me, which leaves me in an uncomfortable position: how do you tell a taco it’s not his turn? One way I’ve found around this problem is to let someone else do the choosing for me. That way I can just shrug my shoulders at the burger and say, “Maybe next time, pal,” and he’ll know I really mean it. But hiring somebody else to pick my fast food meals is probably costly and probably strange enough that only very desperate people would take on the task. So, instead, I have the chef make my selections for me. Whether that chef is Ronald McDonald, Jack in the Box, or, uh, Señor Taco Bell, they tend to have a solution for people like me. Every place has meal packages, sure, to help you take the responsibility out of ordering for yourself. But these meals tend to be essentially the same thing, every time you go back to the restaurant. You still have to actually choose a meal to something happen, and that’s a stumbling block for me. But those latter two restaurants, Jack in the Box and Taco Bell, kindly offer a solution to my problem. They offer to sell items in boxes for a set price. And the best part: there’s almost always a new box to try, every time I go! I can just drive through and say, give me whatever’s in that box, sir or madam, and they’re happy to oblige. Whatever four-course special the chef has ready for me (plus soda), I’m glad to accept. I trust their judgment. I did run into one problem with this method when I tried Jack in the Box a few weeks ago. I went after nine, when a feedbox mystically lowers its price from $8 into $6. I gave my order at the drive through speaker, and sat back with a smile: no more choices need be made today. No more responsibility. And then something happened. He called my bluff: I had no idea what I was ordering, and I didn’t want one. I wanted to know as little as possible about what I’d be shoving into my face fifteen minutes later. “No, sorry.” I didn’t know how else to extricate myself from this mess. I wanted the red sauce off of my hands. I paid and left, with a box. The whole point of having them choose the ingredients of my meal was to avoid making any choices myself. They ruined it by creating multiple boxes. I haven’t been back to Jack in the Box since. At least Taco Bell usually keeps their boxes to one option. I trust them. Jack in the Box tacos are incredibly weird and pretty bad, as a side note. I highly recommend them–just get somebody else to order.